In the recently developed theory by Steven Weinberg and Abdus Salam, that unifies the electromagnetic and weak forces, the vacuum is not empty. This peculiar situation comes about because of the existence of a new type of field, called the Higgs field. The Higgs field has an important physical consequence since its interaction with the W, W and Z particles (the carriers of the weak force) causes them to gain mass at energies below 100 billion electron volts (100 Gev). Above this energy they are quite massless just like the photon and it is this characteristic that makes the weak and electromagnetic forces so similar at high energy. On a somewhat more abstract level, consider Figures 1 and 2 representing the average energy of the vacuum state. If the universe were based on the vacuum state in Figure 1, it is predicted that the symmetry between the electromagnetic and weak interactions would be quite obvious. The particles mediating the forces would all be massless and behave in the same way. The corresponding forces would be indistinguishable. This would be the situation if the universe had an average temperature of 1 trillion degrees so that the existing particles collided at energies of 100 Gev. In Figure 2, representing the vacuum state energy for collision energies below 100 Gev, the vacuum state now contains the Higgs field and the symmetry between the forces is suddenly lost or ‘broken’. Although at low energy the way in which the forces behave is asymmetric, the fundamental laws governing the electromagnetic and weak interactions remain inherently symmetric. This is a very remarkable and profound prediction since it implies that certain symmetries in Nature can be hidden from us but are there nonetheless. During the last 10 years physicists have developed even more powerful theories that attempt to unify not only the electromagnetic and weak forces but the strong nuclear force as well. These are called the Grand Unification Theories (GUTs) and the simplist one known was developed by Howard Georgi, Helen Quinn,and Steven Weinberg and is called SU(5), (pronounced ‘ess you five’). This theory predicts that the nuclear and ‘electroweak’ forces will eventually have the same strength but only when particles collide at energies above 1 thousand trillion GeV corresponding to the unimaginable temperature of 10 thousand trillion trillion degrees! SU(5) requires exactly 24 particles to mediate forces of which the 8 massless gluons of the nuclear force, the 3 massless intermediate vector bosons of the weak force and the single massless photon of the electromagnetic force are 12. The remaining 12 represent a totally new class of particles called Leptoquark bosons that have the remarkable property that they can transform quarks into electrons. SU(5) therefore predicts the existence of a ‘hyperweak’ interaction; a new fifth force in the universe! Currently, this force is 10 thousand trillion trillion times weaker than the weak force but is nevertheless 100 million times stronger than gravity. What would this new force do? Since protons are constructed from 3 quarks and since quarks can now decay into electrons, through the Hyperweak interaction, SU(5) predicts that protons are no longer the stable particles we have always imagined them to be. Crude calculations suggest that they may have half-lives between 10^29 to 10^33 years. An immediate consequence of this is that even if the universe were destined to expand for all eternity, after ‘only’ 10^32 years or so, all of the matter present would catastrophically decay into electrons, neutrinos and photons. The Era of Matter, with its living organisms, stars and galaxies, would be swept away forever, having represented but a fleeting episode in the history of the universe. In addition to proton decay, SU(5) predicts that at the energy characteristic of the GUT transition, we will see the affects of a new family of particles called supermassive Higgs bosons whose masses are expected to be approximately 1 thousand trillion GeV! These particles interact with the 12 Leptoquarks and make them massive just as the Higgs bosons at 100 GeV made the W, W and Z particles heavy. Armed with this knowledge, let’s explore some of the remarkable cosmological consequences of these exciting theories. To see how these theories relate to the history of the universe, imagine if you can a time when the average temperature of the universe was not the frigid 3 K that it is today but an incredable 10 thousand trillion trillion degrees (10^15 GeV). The ‘Standard Model’ of the Big Bang, tells us this happened about 10^-37 seconds after Creation. The protons and neutrons that we are familiar with today hadn’t yet formed since their constituent quarks interacted much too weakly to permit them to bind together into ‘packages’ like neutrons and protons. The remaining constituents of matter, electrons, muons and tau leptons, were also massless and traveled about at essentially light-speed; They were literally a new form of radiation, much like light is today! The 12 supermassive Leptoquarks as well as the supermassivs Higgs bosons existed side-by-side with their anti-particles. Every particle-anti particle pair that was annihilated was balanced by the resurrection of a new pair somewhere else in the universe. During this period, the particles that mediated the strong, weak and electromagnetic forces were completely massless so that these forces were no longer distinguishable. An inhabitant of that age would not have had to theorize about the existence of a symmetry between the strong, weak and electromagnetic interactions, this symmetry would have been directly observable and furthermore, fewer types of particles would exist for the inhabitants to keep track of. The universe would actually have beed much simpler then! As the universe continued to expand, the temperature continued to plummet. It has been suggested by Demetres Nanopoulis and Steven Weinberg in 1979 that one of the supermassive Higgs particles may have decayed in such a way that slightly more matter was produced than anti-matter. The remaining evenly matched pairs of particles and anti-particles then annihilated to produce the radiation that we now see as the ‘cosmic fireball’. Exactly what happened to the universe as it underwent the transitions at 10^15 and 100 GeV when the forces of Nature suddenly became distinguishable is still under investigation, but certain tantalizing descriptions have recently been offered by various groups of theoriticians working on this problem. According to studies by Alan Guth, Steven Weinberg and Frank Wilczyk between 1979 and 1981, when the GUT transition occured, it occured in a way not unlike the formation of vapor bubbles in a pot of boiling water. In this analogy, the interior of the bubbles represent the vacuum state in the new phase, where the forces are distinguishable, embedded in the old symmetric phase where the nuclear, weak and electromagnetic forces are indistinguishable. Inside these bubbles, the vacuum energy is of the type illustrated by Figure 2 while outside it is represented by Figure 1. Since we are living within the new phase with its four distinguishable forces, this has been called the ‘true’ vacuum state. In the false vacuum state, the forces remain indistinguishable which is certainly not the situation that we find ourselves in today! An exciting prediction of Guth’s model is that the universe may have gone through at least one period in its history when the expansion was far more rapid than predicted by the ‘standard’ Big Bang model. The reason for this is that the vacuum itself also contributes to the energy content of the universe just as matter and radiation do however, the contribution is in the opposite sense. Although gravity is an attractive force, the vacuum of space produces a force that is repulsive. As Figures 1 and 2 show, the minimum energy state of the false vacuum at ‘A’ before the GUT transition is at a higher energy than in the true vacuum state in ‘B’ after the transition. This energy difference is what contributes to the vacuum energy. During the GUT transition period, the positive pressure due to the vacuum energy would have been enormously greater than the restraining pressure produced by the gravitational influence of matter and radiation. The universe would have inflated at a tremendous rate, the inflation driven by the pressure of the vacuum! In this picture of the universe, Einstein’s cosmological constant takes on a whole new meaning since it now represents a definite physical concept ; It is simply a measure of the energy difference between the true and false vacuum states (‘B’ and ‘A’ in Figures 1 and 2.) at a particular time in the history of the universe. It also tells us that, just as in de Sitter’s model, a universe where the vacuum contributes in this way must expand exponentially in time and not linearly as predicted by the Big Bang model. Guth’s scenario for the expansion of the universe is generally called the ‘inflationary universe’ due to the rapidity of the expansion and represents a phase that will end only after the true vacuum has supplanted the false vacuum of the old, symmetric phase. A major problem with Guth’s original model was that the inflationary phase would have lasted for a very long time because the false vacuum state is such a stable one. The universe becomes trapped in the cul-de-sac of the false vacuum state and the exponential expansion never ceases. This would be somewhat analogous to water refusing to freeze even though its temperature has dropped well below 0 Centigrade. Recent modifications to the original ‘inflationary universe’ model have resulted in what is now called the ‘new’ inflationary universe model. In this model, the universe does manage to escape from the false vacuum state and evolves in a short time to the familiar true vacuum state. We don’t really know how exactly long the inflationary phase may have lasted but the time required for the universe to double its size may have been only 10^-34 seconds. Conceivably, this inflationary period could have continued for as ‘long’ as 10^-24 seconds during which time the universe would have undergone 10 billion doublings of its size! This is a number that is truely beyond comprehension. As a comparison, only 120 doublings are required to inflate a hydrogen atom to the size of the entire visible universe! According to the inflationary model, the bubbles of the true vacuum phase expanded at the speed of light. Many of these had to collide when the universe was very young in order that the visible universe appear so uniform today. A single bubble would not have grown large enough to encompass our entire visible universe at this time; A radius of some 15-20 billion light years. On the other hand, the new inflationary model states that even the bubbles expanded in size exponentially just as their separations did. The bubbles themselves grew to enormous sizes much greater than the size of our observable universe. According to Albrecht and Steinhardt of the University of Pennsylvania, each bubble may now be 10^3000 cm in size. We should not be too concerned about these bubbles expanding at many times the speed of light since their boundaries do not represent a physical entity. There are no electrons or quarks riding some expandind shock wave. Instead, it is the non-material vacuum of space that is expanding. The expansion velocity of the bubbles is not limited by any physical speed limit like the velocity of light. A potential problem for cosmologies that have phase transitions during the GUT Era is that a curious zoo of objects could be spawned if frequent bubble mergers occured as required by Guth’s inflationary model. First of all, each bubble of the true vacuum phase contains its own Higgs field having a unique orientation in space. It seems likely that no two bubbles will have their Higgs fields oriented in quite the same way so that when bubbles merge, knots will form. According to Gerhard t’Hooft and Alexander Polyakov, these knots in the Higgs field are the magnetic monopoles originally proposed 40 years ago by Paul Dirac and there ought to be about as many of these as there were bubble mergers during the transition period. Upper limits to their abundance can be set by requiring that they do not contribute to ‘closing’ the universe which means that for particles of their predicted mass (about 10^16 GeV), they must be 1 trillion trillion times less abundant than the photons in the 3 K cosmic background. Calculations based on the old inflationary model suggest that the these GUMs (Grand Unification Monopoles) may easily have been as much as 100 trillion times more abundant than the upper limit! Such a universe would definitly be ‘closed’ and moreover would have run through its entire history between expansion and recollapse within a few thousand years. The new inflationary universe model solves this ‘GUM’ overproduction problem since we are living within only one of these bubbles, now almost infinitly larger than our visible universe. Since bubble collisions are no longer required to homogenize the matter and radiation in the universe, very few, if any, monopoles would exist within our visible universe. A prolonged period of inflation would have had an important influence on the cosmic fireball radiation. One long-standing problem in modern cosmology has been that all directions in the sky have the same temperature to an astonishing 1 part in 10,000. When we consider that regions separated by only a few degrees in the sky have only recently been in communication with one another, it is hard to understand how regions farther apart than this could be so similar in temperature. The radiation from one of these regions, traveling at the velocity of light, has not yet made it across the intervening distance to the other, even though the radiation may have started on its way since the universe first came into existence. This ‘communication gap’ would prevent these regions from ironing-out their temperature differences. With the standard, Big Bang model, as we look back to earlier epochs from the present time, the separations between particles decrease more slowly than their horizons are shrinking. Neighboring regions of space at the present time, become disconnected so temperature differences are free to develope. Eventually, as we look back to very ancient times, the horizons are so small that every particle existing then literally fills the entire volume of its own, observable universe. Imagine a universe where you occupy all of the available space! Prior to the development of the inflationary models, cosmologists were forced to imagine an incredably well-ordered initial state where each of these disconnected domains (some 10^86 in number) had nearly identical properties such as temperature. Any departure from this situation at that time would have grown to sizable temperature differences in widely separated parts of the sky at the present time. Unfortunately, some agency would have to set-up these finely-tuned initial conditions by violating causality. The contradiction is that no force may operate by transmitting its influence faster than the speed of light. In the inflationary models, this contradiction is eliminated because the separation between widely scattered points in space becomes almost infinitly small compared to the size of the horizons as we look back to the epoc of inflation. Since these points are now within each others light horizons, any temperature difference would have been eliminated immediatly since hotter regions would now be in radiative contact with colder ones. With this exponentially-growing, de Sitter phase in the universe’s early history we now have a means for resolving the horizon problem. Because of the exponential growth of the universe during the GUT Era, its size may well be essentially infinite for all ‘practical’ purposes . Estimates by Albrecht and Steinhardt suggest that each bubble region may have grown to a size of 10^3000 cm by the end of the inflationary period. Consequently, the new inflationary model predicts that the content of the universe must be almost exactly the ‘critical mass’ since the sizes of each of these bubble regions are almost infinite in extent. The universe is, for all conceivable observations, exactly Euclidean (infinite and flat in geometry) and destined to expand for all eternity to come. Since we have only detected at most 10 percent of the critical mass in the form of luminous matter, this suggests that 10 times as much matter exists in our universe than is currently detectable. Of course, if the universe is essentially infinite this raises the ghastly spectre of the eventual annihilation of all organic and inorganic matter some 10^32 years from now because of proton decay. In spite of its many apparent successes, even the new inflationary universe model is not without its problems. Although it does seem to provide explainations for several cosmological enigmas, it does not provide a convincing way to create galaxies. Those fluctuations in the density of matter that do survive the inflationary period are so dense that they eventually collapse into galaxy-sized blackholes! Neither the precise way in which the transition to ordinary Hubbel expansion occurs nor the duration of the inflationary period are well determined. If the inflationary cosmologies can be made to answer each of these issues satisfactorily we may have, as J. Richard Gott III has suggested, a most remarkable model of the universe where an almost infinite number of ‘bubble universes’ each having nearly infinite size, coexist in the same 4-dimensional spacetime; all of these bubble universes having been brought into existence at the same instant of creation. This is less troublesome than one might suspect since, if our universe is actually infinite as the available data suggests, so too was it infinite even at its moment of birth! It is even conceivable that the universe is ‘percolating’ with new bubble universes continually coming into existence. Our entire visible universe, out to the most distant quasar, would be but one infinitessimal patch within one of these bubble regions. Do these other universes have galaxies, stars, planets and living creatures statistically similar to those in our universe? We may never know. These other universes, born of the same paroxicism of Creation as our own, are forever beyond our scrutiny but obviously not our imaginations! Finally, what of the period before Grand Unification? We may surmise that at higher temperatures than the GUT Era, even the supermassive Higgs and Leptoquark bosons become massless and at long last we arrive at a time when the gravitational interaction is united with the weak, electromagnetic and strong forces. Yet, our quest for an understanding of the origins of the universe remains incomplete since gravity has yet to be brought into unity with the remaining forces on a theoretical basis. This last step promises to be not only the most difficult one to take on the long road to unification but also appears to hold the greatest promise for shedding light on some of the most profound mysteries of the physical world. Even now, a handful of theorists around the world are hard at work on a theory called Supergravity which unites the force carriers (photons, gluons, gravitons and the weak interaction bosons) with the particles that they act on (quarks, electrons etc). Supergravity theory also predicts the existence of new particles called photinos and gravitinos. There is even some speculation that the photinos may fill the entire universe and account for the unseen ‘missing’ matter that is necessary to give the universe the critical mass required to make it exactly Euclidean. The gravitinos, on the other hand, prevent calculations involving the exchange of gravitons from giving infinite answers for problems where the answers are known to be perfectly finite. Hitherto, these calculations did not include the affects of the gravitinos. Perhaps during the next decade, more of the details of the last stage of Unification will be hammered out at which time the entire story of the birth of our universe can be told. This is, indeed, an exciting time to be living through in human history. Will future generations forever envy us our good fortune, to have witnessed in our lifetimes the unfolding of the first comprehensive theory of Existence? Black holes…quarks…dark matter. It seems like the cosmos gets a little stranger every year. Until recently, the astronomical universe known to humans was populated by planets, stars, galaxies, and scattered nebulae of dust and gas. Now, theoretists tell us it may also be inhabited by objects such as superstrings, dark matter and massive neutrinos — objects that have yet to be discovered if they exist at all! As bizarre as these new constituents may sound, you don’t have to be a rocket scientist to appreciate the most mysterious ingredient of them all. It is the inky blackness of space itself that commands our attention as we look at the night sky; not the sparse points of light that signal the presence of widely scattered matter. During the last few decades, physicists and astronomers have begun to recognize that the notion of empty space presents greater subtleties than had ever before been considered. Space is not merely a passive vessel to be filled by matter and radiation, but is a dynamic, physical entity in its own right. One chapter in the story of our new conception of space begins with a famous theoretical mistake made nearly 75 years ago that now seems to have taken on a life of its own. In 1917, Albert Einstein tried to use his newly developed theory of general relativity to describe the shape and evolution of the universe. The prevailing idea at the time was that the universe was static and unchanging. Einstein had fully expected general relativity to support this view, but, surprisingly, it did not. The inexorable force of gravity pulling on every speck of matter demanded that the universe collapse under its own weight. His remedy for this dilemma was to add a new ‘antigravity’ term to his original equations. It enabled his mathematical universe to appear as permanent and invariable as the real one. This term, usually written as an uppercase Greek lambda, is called the ‘cosmological constant’. It has exactly the same value everywhere in the universe, delicately chosen to offset the tendency toward gravitational collapse at every point in space. A simple thought experiment may help illustrate the nature of Lambda. Take a cubic meter of space and remove all matter and radiation from it. Most of us would agree that this is a perfect vacuum. But, like a ghost in the night, the cosmological constant would still be there. So, empty space is not really empty at all — Lambda gives it a peculiar ‘latent energy’. In other words, even Nothing is Something! Einstein’s fudged solution remained unchallenged until 1922 when the Russian mathematician Alexander Friedmann began producing compelling cosmological models based on Einstein’s equations but without the extra quantity. Soon thereafter, theorists closely examining Einstein’s model discovered that, like a pencil balanced on its point, it was unstable to collapse or expansion. Later the same decade, Mount Wilson astronomer Edwin P. Hubble found direct observational evidence that the universe is not static, but expanding. All this ment that the motivation for introducing the cosmological constant seemed contrived. Admitting his blunder, Einstein retracted Lambda in 1932. At first this seemed to end the debate about its existence. Yet decades later, despite the great physicist’s disavowal, Lambda keeps turning up in cosmologists’ discussions about the origin, evolution, and fate of the universe. Friedmann’s standard ‘Big Bang’ model without a cosmological constant predicts that the age of the universe, t0, and its expansion rate (represented by the Hubble parameter, H0) are related by the equation t0 = 2/3H0. Some astronomers favor a value of H0 near 50 kilometers per second per megaparsec (one megaparsec equals 3.26 million light years). But the weight of the observational evidence seems to be tipping the balance towards a value near 100. In the Friedmann model, this implies that the cosmos can be no more than 7 billion years old. Yet some of our galaxy’s globular clusters have ages estimated by independent methods of between 12 and 18 billion years! In what’s called the Einstein-DeSitter cosmology, the Lambda term helps to resolve this discrepancy. Now a large value for the Hubble parameter can be attributed in part to “cosmic repulsion”. This changes the relationship between t0 and H0, so that for a given size, the universe is older than predicted by the Friedmann model. In one formulation of Einstein’s equation, Lambda is expressed in units of matter density. This means we can ask how the cosmological constant, if it exists at all, compares with the density of the universe in the forms of stars and galaxies. So far, a careful look at the available astronomical data has produced only upper limits to the magnitude of Lambda. These vary over a considerable range – from about 10 percent of ordinary matter density to several times that density. The cosmological constant can also leave its mark on the properties of gravitational lenses and faint galaxies. One of the remarkable features of Einstein’s theory of general relativity is its prediction that space and time become deformed or ‘warped’ in the vicinity of a massive body such as a planet, star or even a galaxy. Light rays passing through such regions of warped “space-time” have their paths altered. In the cosmological arena, nearby galaxies can deflect and distort the images of more distant galaxies behind them. Sometimes, the images of these distant galaxies can appear as multiple images surrounding the nearby ‘lensing’ galaxy. At Kyoto University M. Fukugita and his coworkers predicted that more faint galaxies and gravitational lenses will be detected than in a Friedmann universe if Lambda is more than a few times the matter density. Edwin Turner, an astrophysicist at Princeton University also reviewed the existing, scant, data on gravitational lenses and found that they were as numerous as expected for Lambda less that a few times the matter density. By the best astronomical reconning, Lambda is probably not larger than the observed average matter density of the universe. For that matter, no convincing evidence is available to suggest that Lambda is not exactly equal to zero. So why not just dismiss it as an unnecessary complication? Because the cosmological constant is no longer, strictly, a construct of theoretical cosmology. To understand how our universe came into existence, and how its various ingredients have evolved, we must delve deeply into the fundamental constituents of matter and the forces that dictate how it will interact. This means that the questions we will have to ask will have more to do with physics than astronomy. Soon after the big bang, the universe was at such a high temperature and density that only the details of matter’s composition (quarks, electrons etc) and how they interact via the four fundamental forces of nature were important. They represented the most complex collections of matter in existence, long before atoms, planets, stars and galaxies had arrived on the scene. For two decades now, physicists have been attempting to unify the forces and particles that make up our world – to find a common mathematical description that encompasses them all. Some think that such a Theory of Everything is just within reach. It would account not only for the known forms of matter, but also for the fundamental interactions among them: gravity, electromagnetism, and the strong and weak nuclear forces. These unification theories are known by a variety of names: grand unification theory, supersymmetry theory and superstring theory. Their basic claim is that Nature operates according to a small set of simple rules called symmetries. The concept of symmetry is at least as old as the civilization of ancient Greece, whos art and archetecture are masterworks of simplicity and balance. Geometers have known for a long time that a simple cube can be rotated 90 degrees without changing its outward appearance. In two dimensions, equalateral triangles look the same when they are rotated by 120 degrees. These are examples of the geometric concept of Rotation Symmetry. There are parallels to geometric symmetry in the way that various physical phenomena and qualities of matter express themselves as well. For example, the well-known principle of the Conservation of Energy is a consequence of the fact that when some collections of matter and energy are examined at different times, they each have precisely the same total energy, just as a cube looks the same when it is rotated in space by a prescribed amount. Symmetry under a ‘shift in time’ is as closely related to the Conservation of Energy as is the symmetry of a cube when rotated by 90 degrees. Among other things, symmetries of Nature dictate the strengths and ranges of the natural forces and the properties of the particles they act upon. Although Nature’s symmetries are hidden in today’s cold world, they reveal themselves at very high temperatures and can be studied in modern particle accelerators. The real goal in unification theory is actually two-fold: not only to uncover and describe the underlying symmetries of the world, but to find physical mechanisms for ‘breaking’ them at low energy. After all, we live in a complex world filled with a diversity of particles and forces, not a bland world with one kind of force and one kind of particle! Theoreticians working on this problem are often forced to add terms to their equations that represent entirely new fields in Nature. The concept of a field was invented by mathematicians to express how a particular quantity may vary from point to point in space. Physicists since the 18th century have adopted this idea to describe quantitatively how forces such as gravity and magnetism change at different distances from a body. The interactions of these fields with quarks, electrons and other particles cause symmetries to break down. These fields are usually very different than those we already know about. The much sought after Higgs boson field, for example, was introduced by Sheldon Glashow, Abdus Salam and Steven Weinberg in their unified theory of the electromagnetic and weak nuclear forces. Prior to their work, the weak force causing certain particles to decay, and the electromagnetic force responsible for the attraction between charged particles and the motion of compass needles, were both considered to be distinct forces in nature. By combining their mathematical descriptions into a common language, they showed that this distinction was not fundamental to the forces at all! A new field in nature called the Higgs field makes these two forces act differently at low temperature. But at temperatures above 1000 trillion degrees, the weak and electromagnetic forces become virtually identical in the way that they affect matter. The corresponding particles called the Higgs Boson not only cause the symmetry between the electromagnetic and weak forces to be broken at low temperature, but they are also responsible for confiring the property of mass on particles such as the electrons and the quarks! There is, however a price that must be paid for introducing new fields into the mathematical machinery. Not only do they break symmetries, but they can also give the vacuum state an enormous latent energy that, curiously, behaves just like Lambda in cosmological models. The embarrassment of having to resurrect the obsolete quantity Lambda is compounded when unification theories are used to predict its value. Instead of being at best a vanishingly minor ingredient to the universe, the predicted values are in some instances 10 to the power of 120 times greater than even the most generous astronomical upper limits! It is an unpleasant fact of life for physicists that the best candidates for the Theory of Everything always have to be fine-tuned to get rid of their undesirable cosmological consequences. Without proper adjustment, these candidates may give correct predictions in the microscopic world of particle physics, but predict a universe which on its largest scales looks very different from the one we inhabit. Like a messenger from the depths of time, the smallness – or absence – of the cosmological constant today is telling us something important about how to craft a correct Theory of Everything. It is a signpost of the way Nature’s symmetries are broken at low energy, and a nagging reminder that our understanding of the physical world is still incomplete in some fundamental way. Most physicists expect the Theory of Everything will describe gravity the same way we now describe matter and the strong, weak and electromagnetic forces – in the language of quantum mechanics. Gravity is, after all, just another force in Nature. So far this has proven elusive, due in part to the sheer complexity of the equations of general relativity. Scientists since Einstein have described gravity ( as well as space and time) in purely geometric terms. Thus we speak of gravity as the “curvature of space-time”. To acheive complete unification, the dialects of quantum matter and geometric space have to be combined into a single language. Matter appears to be rather precisely described in terms of the language of quantum mechanics. Quarks and electrons exchange force-carrying particles such as photons and gluons and thereby feel the electromagnetic and strong nuclear forces. But, gravity is described by Einstein’s theory of general relativity as a purely geometric phenomenon. These geometric ideas of curvature and the dimensionality of space have nothing to do with quantum mechanics. To unify these two great foundations of physics, a common language must be found. This new language will take some getting used to. In it, the distinction between matter and space dissolves away and is lost completely; matter becomes a geometric phenomenon, and at the same time, space becomes an exotic form of matter. Beginning with work on a quantum theory of gravity by John Wheeler and Bryce DeWitt in the 1960’s, and continuing with the so-called superstring theory of John Schwartz and Michael Green in the 1980’s, a primitive version of such a ‘quantum-geometric’ language is emerging. Not surprisingly, it borrows many ideas from ordinary quantum mechanics. A basic concept in quantum mechanics is that every system of elementary particles is defined by a mathematical quantity called a wave function. This function can be used, for example, to predict the probability of finding an electron at a particular place and time within an atom. Rather than a single quantity, the wave function is actually a sum over an infinite number of factors or ‘states’, each representing a possible measurement outcome. Only one of these states can be observed at a time. By direct analogy, in quantum gravitation, the geometry of space-time, whether flat or curved, is only one of an infinite variety of geometric shapes for space-time, and therefore the universe. All of these possibilities are described as separate states in the wave function for the universe. But what determines the probability that the universe will have the particular geometry we now observe out of the infinitude of others? In quantum mechanics, the likelihood that an electron is located somewhere within an atom is determined by the external electric field acting on it. That field is usually provided by the protons in the atomic nucleus. Could there be some mysterious field ‘outside’ our universe that determines its probability? According to Cambridge University theorist Stephen Hawking, this is the wrong way to look at the problem. Unlike the electron acted upon by protons, our universe is completely self-contained. It requires no outside conditions or fields to help define its probability. The likelihood that our universe looks the way it does depends only on the strengths of the fields within it. Among these internal fields, there may even be ones that we haven’t yet discovered. Could the cosmological constant be the fingerprint in our universe of a new ‘hidden’ field in Nature? This new field could affect the likelihood of our universe just as a kettle of soup may contain unknown ingredients although we can still precisely determine the kettle’s mass. A series of mathematical considerations led Hawking to deduce that the weaker the hidden field becomes, the smaller will be the value we observe for the cosmological constant, and surprisingly, the more likely will be the current geometry of the universe. This, in turn, implies that if Lambda were big enough to measure by astronomers in the first place, our universe would be an improbable one. Philosophically, this may not trouble those who see our cosmos as absolutely unique, but in a world seemingly ruled by probability, a counter view is also possible. There may, in fact, exist an infinite number of universes, but only a minority of them have the correct blend of physical laws and physical conditions resembling our life-nurturing one. Hawking continued his line of speculation by suggesting that, if at the so-called Planck scale of 10 to the power of -33 centimeters the cosmos could be thought of as an effervescent landscape, or “space-time foam”, then perhaps a natural mechanism could exist for eliminating the cosmological constant for good. One of the curiosities of combining the speed of light and Newton’s constant of gravitation from general relativity, with Planck’s constant from quantum mechanics, is that they can be made to define unique values for length, time and energy. Physicists believe that at these Planck scales represented by 10 to the power of -33 centimeters and 10 to the power of -43 seconds, general relativity and quantum mechanics blend together to become a single, comprehensive theory of the physical world: The Theory Of Everything. The energy associated with this unification, 10 to the power of 19 billion electron volts, is almost unimaginably big by the standards of modern technology. The universe itself, soon after the Big Bang, must also have passed through such scales of space, time and energy during its first instants of existence. Cosmologists refer to this period as the Planck Era. It marks the earliest times that physicists are able to explore the universe’s physical state without having a complete Theory of Everything to guide them. Harvard University physicist Sidney Coleman has recently pursued this thought to a possible conclusion. Instead of some mysterious new field in Nature, maybe the Lambda term appears in our theories because we are using the wrong starting model for the geometry of space at the Planck scale. Previous thinking on the structure of space-time had assumed that it behaved in some sense like a smooth rubber sheet. Under the action of matter and energy, space-time could be deformed into a variety of shapes, each a possible geometric state for the universe. Nearly all candidates for the Theory of Everything’s embed their fields and symmetries in such a smooth geometrical arena. But what if space-time were far more complicated? One possibility is that ‘wormholes’ exist, filling space-time with a network of tunnels. The fabric of space-time may have more in common with a piece of Swiss cheese than with a smooth rubber sheet. According to Coleman, the addition of wormholes to space-time means that, like the ripples from many stones tossed into a pond, one geometric state for the universe could interfere with another. The most likely states ( or the biggest ripples) would win out. The mathematics suggest that quantum wormhole interference at the Planck scale makes universes with cosmological constants other than zero exceedingly unlikely. How big would wormholes have to be to have such dramatic repurcussions? Surprisingly, the calculations suggest that small is beautiful. Wormholes the size of dogs and planets would be very rare. Universes containing even a few of them would exist with a vanishingly low probability. But wormholes smaller than 10 to the power of -33 centimeters could be everywhere. A volume the size of a sugar cube might be teeming with uncounted trillions of them flashing in and out of existence! Coleman proposes that the action of these previously ignored mini- wormholes upon the geometric fabric of the universe that forces Lambda to be almost exactly zero. Like quantum ‘Pac Men’, they gobble up all the latent energy of space-time that would otherwise have appeared to us in the form of a measureable cosmological constant! The addition of wormholes to the description of space-time admits the possibility that our universe did not spring into being aloof and independent, but was influenced by how other space-times had already evolved – ghostly mathematical universes with which we can never communicate directly. The most likely of these universes had Lambda near zero, and it is these states that beat out all other contenders. In a bizarre form of quantum democracy, our universe may have been forced to follow the majority, evolving into the high probability state we now observe, without a detectable cosmological constant. Wormholes? Wave functions? Hidden fields? The answer to the cosmological constant’s smallness, or absence, seems to recede into the farthest reaches of abstract thinking, faster than most of us can catch up. As ingenious as these new ideas may seem, the final pages in this unusual story have probably not been written, especially since we can’t put any of these ideas to a direct test. It is a tribute to Einstein’s genius that even his ‘biggest blunder’ made near the beginning of this century still plagues physicists and astronomers as we prepare to enter the 21st century. Who would ever have thought that something that may not even exist would lead to such enormous problems! The proliferation of smartphones with internal sensors has led to some interesting opportunities to make large-scale measurements of a variety of physical phenomena. The iOS app ‘Gravity Meter’ and its android equivalent have been used to make measurements of the local surface acceleration, which is nominally 9.8 meters/sec2. The apps typically report the local acceleration to 0.01 (iOS) or even 0.001 (android) meters/sec2 accuracy, which leads to two interesting questions: 1)How reliable are these measurements at the displayed decimal limit, and 2) Can smartphones be used to measure expected departures from the nominal surface acceleration due to Earth rotation? Here is a map showing the magnitude of this (centrifugal) rotation effect provided by The Physics Forum. As Earth rotates, any object on its surface will feel a centrifugal force directed outward from the center of Earth and generally in the direction of local zenith. This causes Earth to be slightly bulged-out at the equator compared to the poles, which you can see from the difference between its equatorial radius of 6,378.14 km versus its polar radius of 6,356.75 km: a polar flattening difference of 21.4 kilometers. This centrifugal force also has an effect upon the local surface acceleration by reducing it slightly at the equator compared to the poles. At the equator, one would measure a value for ‘g’ that is about 9.78 m/sec2 while at the poles it is about 9.83 m/sec2. Once again, and this is important to avoid any misconceptions, the total acceleration defined as gravity plus centrifugal is reduced, but gravity is itself not changed because from Newton’s Law of Universal Gravitation, gravity is due to mass not rotation. 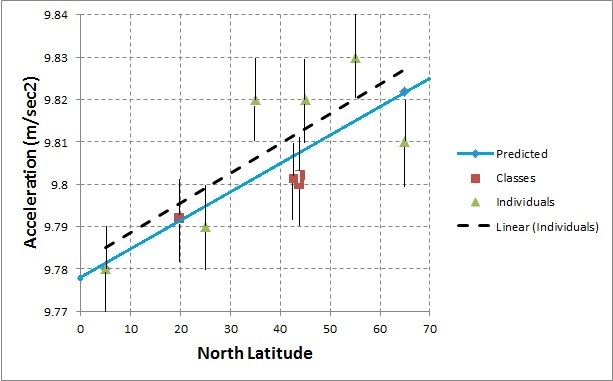 Assuming that the smartphone accelerometers are sensitive enough, they may be able to detect this equator-to-pole difference by comparing the surface acceleration measurements from observers at different latitudes. Experiment 1 – How reliable are ‘gravity’ measurements at the same location? To check this, I looked at the data from several participating classrooms at different latitudes, and selected the more numerous iOS measurements with the ‘Gravity Meter’ app. These data were kindly provided by Ms. Melissa Montoya’s class in Hawaii (+19.9N), George Griffith’s class in Arapahoe, Nebraska (+40.3N), Ms. Sue Lamdin’s class in Brunswick, Maine (+43.9N), and Elizabeth Bianchi’s class in Waldoboro, Maine (+44.1N). All four classrooms measurements, irrespective of latitude (19.9N, 40.3N, 43.9N or 44.1N) showed distinct ‘peaks’, but also displayed long and complicated ‘tails’, making these distributions not Gaussian as might be expected for random errors. This suggests that under classroom conditions there may be some systematic effects introduced from the specific ways in which students may be making the measurements, introducing complicated and apparently non-random, student-dependent corrections into the data. A further study using the iPad data from Elizabeth Bianchi’s class, I discovered that at least for iPads using the Gravity Sensor app, there was a definite correlation between when the measurement was made and the time it was made during a 1.5-hour period. This resembles a heating effect, suggesting that the longer you leave the technology on before making the measurement, the larger will be the measured value. I will look into this at a later time. The non-Gaussian behavior in the current data does not make it possible to assign a normal average and standard-deviation to the data. Experiment 2 – Can the rotation of Earth be detected? Although there is the suggestion that in the 4-classroom data we could see a nominal centrifugal effect of about the correct order-of-magnitude, we were able to get a large sample of individual observers spanning a wide latitude range, also using the iOS platform and the same ‘Gravity Meter’ app. Including the median values from the four classrooms in Experiment 1, we had a total of 41 participants: Elizabeth Abrahams, Jennifer Arsenau, Dorene Brisendine, Allen Clermont, Hillarie Davis, Thom Denholm, Heather Doyle, Steve Dryer, Diedra Falkner, Mickie Flores, Dennis Gallagher, Robert Gallagher, Rachael Gerhard, Robert Herrick, Harry Keller, Samuel Kemos, Anna Leci, Alexia Silva Mascarenhas, Alfredo Medina, Heather McHale, Patrick Morton, Stacia Odenwald, John-Paul Rattner, Pat Reiff, Ghanjah Skanby, Staley Tracy, Ravensara Travillian, and Darlene Woodman. where the polar acceleration is 9.806 m/sec2 and the equatorial acceleration is 9.780 m/sec2. Note: No correction for lunar and solar tidal effects have been made since these are entirely undetectable with this technology. 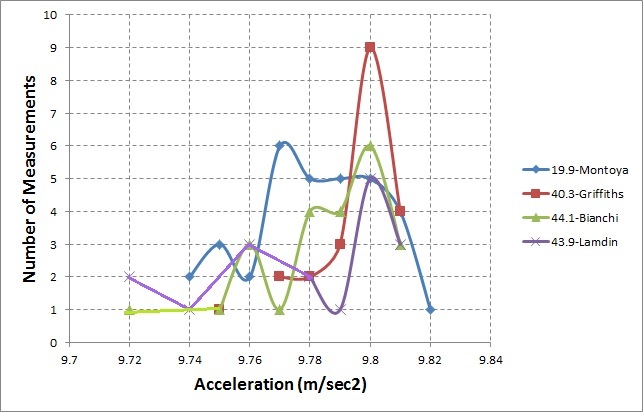 The solid blue line is the predicted acceleration. The dashed black line is the linear regression for the equally-weighted individual measurements. The median values of the classroom points are added to show their distribution. It is of interest that the linear regression line is parallel, and nearly coincident with, the predicted line, which again suggests that Earth’s rotation effect may have been detected in this median-sampled data set provided by a total of 37 individuals. The classroom points clustering at ca +44N represent a total of 36 measures representing the plotted median values, which is statistically significant. Taken at face value, the classroom data would, alone, support the hypothesis that there was a detection of the rotation effect, though they are consistently 0.005 m/sec2 below the predicted value at the mid-latitudes. The intrinsic variation of the data, represented by the consistent +/-0.01 m/sec2 high-vs-low range of all of the individual samples, suggests that this is probably a reasonable measure of the instrumental accuracy of the smartphones. Error bars (thin vertical black lines) have been added to the plotted median points to indicate this accuracy. The bottom-line seems to be that it may be marginally possible to detect the Earth rotation effect, but precise measurements at the 0.01 m/sec2 level are required against what appears to be a significant non-Gaussian measurement background. Once again, some of the variation seen at each latitude may be due to how warm the smartphones were at the time of the measurement. The android and iOS measurements do seem to be discrepant with the android measurements leading to a larger measurement variation. Check back here on Wednesday, March 29 for the next topic! In grade school we learned that gravity is an always-attractive force that acts between particles of matter. Later on, we learn that it has an infinite range through space, weakens as the inverse-square of the distance between bodies, and travels exactly at the speed of light. It doesn’t take a rocket scientist to remind you that humans have always known about gravity! Its first mathematical description as a ‘universal’ force was by Sir Isaac Newton in 1666. Newton’s description remained unchanged until Albert Einstein published his General Theory of Relativity in 1915. Ninety years later, physicists, such as Edward Witten, Steven Hawkings, Brian Greene and Lee Smolin among others, are finding ways to improve our description of ‘GR’ to accommodate the strange rules of quantum mechanics. Ironically, although gravity is produced by matter, General Relativity does not really describe matter in any detail – certainly not with the detail of the modern quantum theory of atomic structure. In the mathematics, all of the details of a planet or a star are hidden in a single variable, m, representing its total mass. The most amazing thing about gravity is that is a force like no other known in Nature. It is a property of the curvature of space-time and how particles react to this distorted space. Even more bizarrely, space and time are described by the mathematics of GR as qualities of the gravitational field of the cosmos that have no independent existence. Gravity does not exist like the frosting on a cake, embedded in some larger arena of space and time. Instead, the ‘frosting’ is everything, and matter is embedded and intimately and indivisibly connected to it. If you could turn off gravity, it is mathematically predicted that space and time would also vanish! You can turn off electromagnetic forces by neutralizing the charges on material particles, but you cannot neutralize gravity without eliminating spacetime itself. Its geometric relationship to space and time is the single most challenging aspect of gravity that has prevented generations of physicists from mathematically describing it in the same way we do the other three forces in the Standard Model. Einstein’s General Relativity, published in 1915, is our most detailed mathematical theory for how gravity works. With it, astronomers and physicists have explored the origin and evolution of the universe, its future destiny, and the mysterious landscape of black holes and neutron stars. 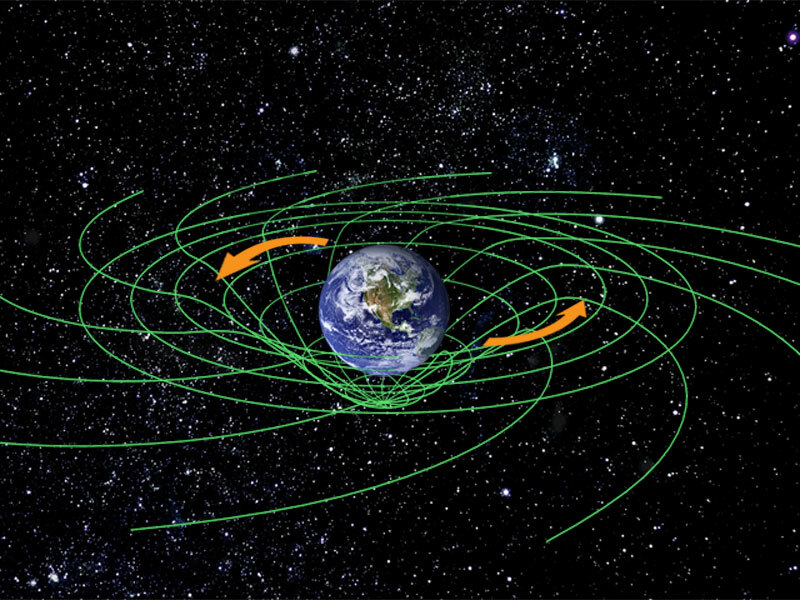 General Relativity has survived many different tests, and it has made many predictions that have been confirmed. So far, after 90 years of detailed study, no error has yet been discovered in Einstein’s original, simple theory. Currently, physicists have explored two of its most fundamental and exotic predictions: The first is that gravity waves exist and behave as the theory predicts. The second is that a phenomenon called ‘frame-dragging’ exists around rotating massive objects. Theoretically, gravity waves must exist in order for Einstein’s theory to be correct. They are distortions in the curvature of spacetime caused by accelerating matter, just as electromagnetic waves are distortions in the electromagnetic field of a charged particle produced by its acceleration. Gravity waves carry energy and travel at light-speed. At first they were detected indirectly. By 2004, astronomical bodies such as the Hulse-Taylor orbiting pulsars were found to be losing energy by gravity waves emission at exactly the predicted rates. Then in 2016, the twin LIGO gravity wave detectors detected the unmistakable and nearly simultaneous pulses of geometry distortion created by colliding black holes billions of light years away. Astronomers also detected by 1997 the ‘frame-dragging’ phenomenon in X-ray studies of distant black holes. As a black hole (or any other body) rotates, it actually ‘drags’ space around with it. This means that you cannot have stable orbits around a rotating body, which is something totally unexpected in Newton’s theory of gravity. 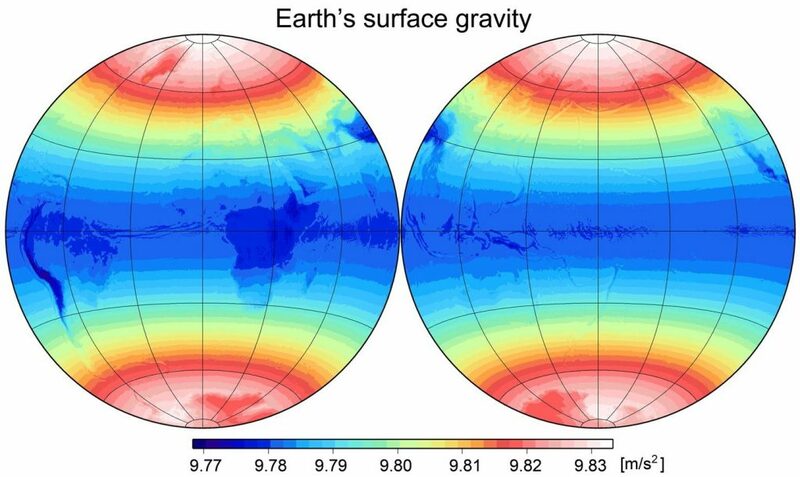 The Gravity Probe-B satellite orbiting Earth also confirmed in 2011 this exotic spacetime effect at precisely the magnitude expected by the theory for the rotating Earth. Gravity also doesn’t care if you have matter or anti-matter; both will behave identically as they fall and move under gravity’s influence. This quantum-scale phenomenon was searched for at the Large Hadron Collider ALPHA experiment, and in 2013 researchers placed the first limits on how matter and antimatter ‘fall’ in Earth’s gravity. Future experiments will place even more stringent limits on just how gravitationally similar matter and antimatter are. Well, at least we know that antimatter doesn’t ‘fall up’! There is only one possible problem with our understanding of gravity known at this time. Applying general relativity, and even Newton’s Universal Gravitation, to large systems like galaxies and the universe leads to the discovery of a new ingredient called Dark Matter. There do not seem to be any verifiable elementary particles that account for this gravitating substance. 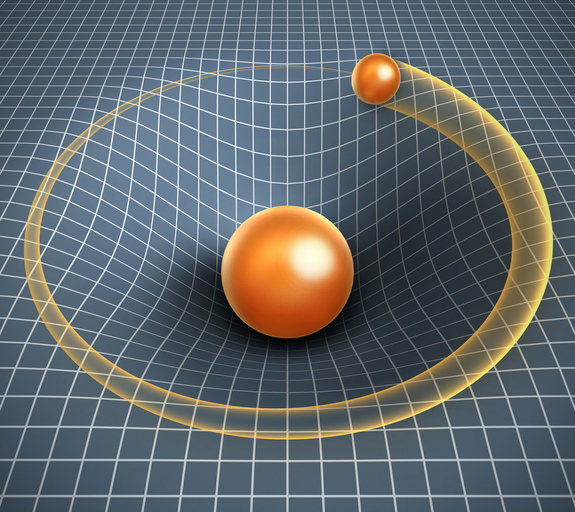 Lacking a particle, some physicists have proposed modifying Newtonian gravity and general relativity themselves to account for this phenomenon without introducing a new form of matter. But none of the proposed theories leave the other verified predictions of general relativity experimentally intact. 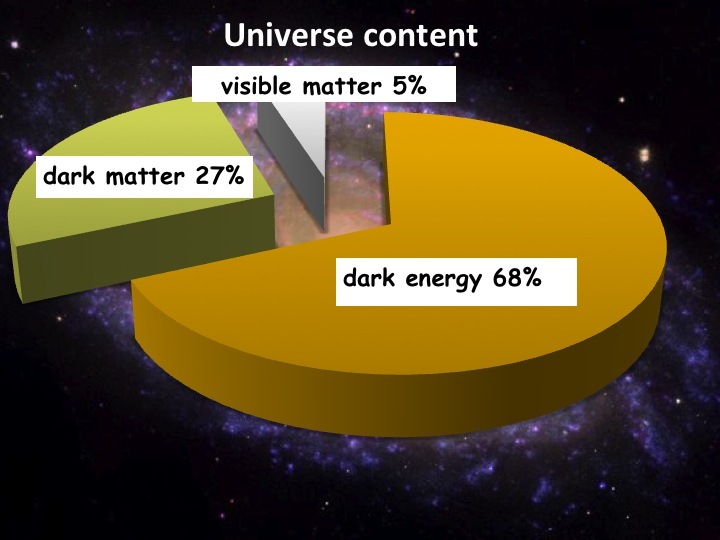 So is Dark Matter a figment of an incomplete theory of gravity, or is it a here-to-fore undiscovered fundamental particle of nature? It took 50 years for physicists to discover the lynchpin particle called the Higgs boson. This is definitely a story we will hear more about in the decades to come! There is much that we now know about gravity, yet as we strive to unify it with the other elementary forces and particles in nature, it still remains an enigma. But then, even the briefest glance across the landscape of the quantum world fills you with a sense of awe and wonderment at the improbability of it all. At its root, our physical world is filled with improbable and logic-twisting phenomena and it simply amazing that they have lent themselves to human logic to the extent that they have! Return here on Monday, March 13 for my next blog!